Mystic Seaport in Mystic, CT is planning to hold an event to welcome the whaleship Charles W. Morgan home to the museum on Wednesday, August 6 at 5:30 pm. The ship will be towed from New London after the crew has downrigged the vessel and removed a portion of her ballast to reduce her draft so she can navigate the Mystic River. The Morgan will be greeted at her berth at Chubb’s Wharf by bagpipers and a brief ceremony to commemorate the conclusion of the ship’s historic 38th Voyage. The dockside exhibition that accompanied the ship at her port visits on the voyage will be set up and open to visitors on the wharf. Activities include maritime skills demonstrations, music and dramatic performances, and historic interpretation of the Morgan and whaling. Shaefer’s Spouter Tavern will be open for food and beverages. In the event of a weather delay, the backup dates are Thursday, August 7 at 6:30 pm. and Friday, August 8 at 7:30 pm. 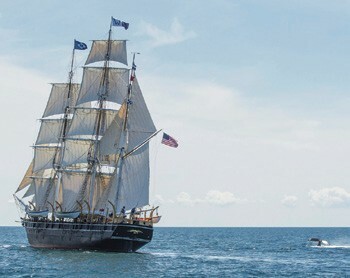 For the latest information on the status of the Morgan, check the 38th Voyage homepage at mysticseaport.org/38thvoyage. Mystic Seaport is holding a Morgan fundraiser on Saturday, August 9 at 6 pm. The evening’s festivities include sumptuous food and delicious drinks representing the Morgan’s historic ports of call, and live music by West End Blend. Festive, boating attire is requested. Tickets are $175 per person. To RSVP by phone, please call 860-572-5308. For additional information, email membership@mysticseaport.org. Dan McFadden at Mystic Seaport contributed to this report.